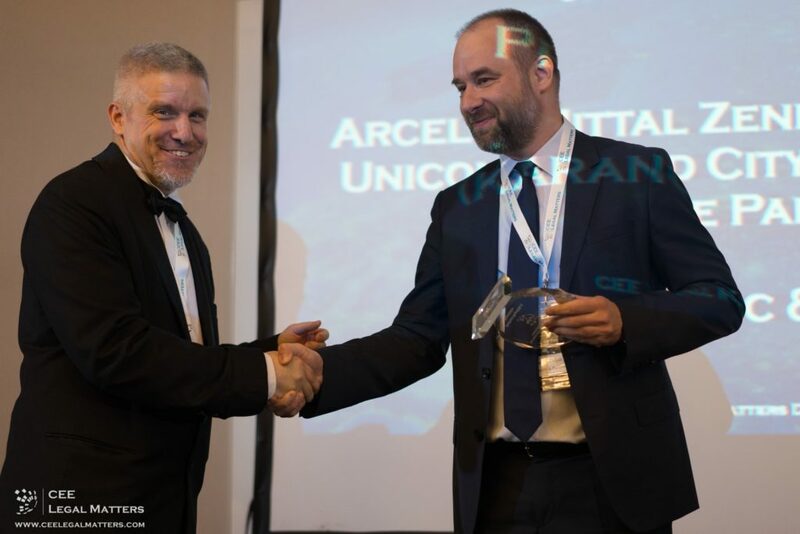 We are pleased to announce that Karanovic & Partners, in cooperation with local lawyers, won two Deal of the Year awards – ArcelorMittal Zenica, Finnish Fund for Industrial Development, KPA Unicon Oy, and City of Zenica PPP in Bosnia and Herzegovina and for PPF’s Acquisition of Telenor’s Telecom Business in Montenegro. Awarded by the renowned CEE Legal Matters magazine, this is the second year in a row that our firm’s accomplishments are chosen among some of the biggest and most important deals by leading law firms in Central and Eastern European jurisdictions. The accolades were awarded at the Deal of the Year Awards Banquet at the Budapest Marriott on 28 March 2019. With more than 200 senior legal professionals from across the region attending, Senior Partner Marjan Poljak and Senior Associate* Milena Roncevic Pejovic accepted the awards on behalf of the firm. “I am more than happy that Karanovic & Partners is now traditionally among the winners of these prestigious awards. In the first place I would like to congratulate to our team and to our clients and thank them for their trust, as well to CEE Legal Matters for recognising the importance of these deals for the entire region”, said Marjan Poljak, who attended the award ceremony in Budapest. For the Deal of Year in Bosnia & Herzegovina, the panel of judges chose work on the ArcelorMittal Zenica, Finnish Fund for Industrial Development, KPA Unicon Oy, and City of Zenica PPP. Local lawyers in cooperation with Karanovic & Partners advised ArcelorMittal Zenica, a member of ArcelorMittal Group and the major producer of long steel products in the Balkan region and the top foreign investor in Bosnia and Herzegovina, on its contemplated investment in a public private partnership project to construct a combined thermal power plant in Zenica. This is a mayor project with strategic significance for local population and community development, since it will resolve issues with pollution and heating in the City of Zenica. Cooperating lawyers involved with this deal consisted of Partner* Nihad Sijerčić and Senior Associates* Amina Đugum and Lejla Popara. For the jurisdiction of Montenegro, the Deal of the Year was PPF’s Acquisition of Telenor’s Telecom Business for EUR 2.8 billion. This is a landmark transaction for the telecommunications sector in Central and Eastern Europe. Lawyers in cooperation with Karanovic & Partners advised PPF Group in the transaction concerning operations in Montenegro and in Serbia. The Karanovic & Partners legal team was lead by Partner* Milos Jakovljević, Senior Associate* Milena Rončević Pejović and Associates* Sava Drača and Sonja Guzina.